Has a very wide natural range. Confirmed populations exist in Ecuador, Colombia, Venezuela, Guyana, Suriname, French Guiana, Peru, Bolivia, Brazil, and Argentina. Occurences in Paraguay and Uruguay are apparently unconfirmed. 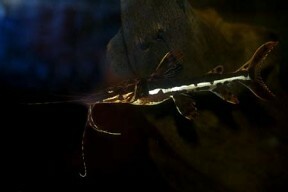 Inhabits a vatiety of biotopes, from large rivers and lakes to areas of flooded forest. Supposedly it’s often found in more sluggish habitats than many large Pimelodids. 41.6″ (104cm) and up to 70kg in weight! This is the size of the largest fish caught and recorded by science. 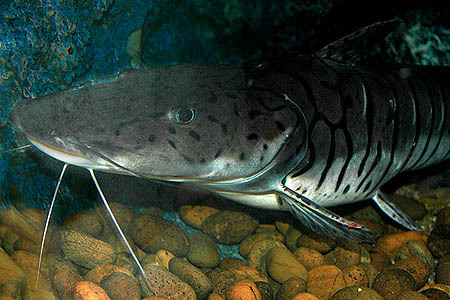 It’s reputed to grow even larger in some of its native waters. Something in the region of 12′ x 8′ x 4′ (360cm x 240cm x 120cm) – 10,368 litres would be needed for a fully-grown fish. Even this would not give it space to cruise around as it would in the wild. Choice of substrate can be an issue, as most grades of gravel can either be swallowed or become caught in the delicate gills. Sand is ok, but don’t expect it to stay in one place. A layer of large, smooth pebbles is a better option. Some hobbyists simply leave the substrate out altogether, which certainly makes cleaning the tank an easier task. It’s debatable as to whether this species should be considered an aquarium subject at all, given its eventual size. All too often juveniles are sold without adequate information regarding their long term care. These cats can and will attain something close to their maximum size in captivity, and will do so quite quickly. The myth that they will only grow to match the size of the tank they’re kept in is just that – a myth. It’s also worth noting that species such as this can live for well over 20 years, making it a considerable long term commitment. Many aquarists buy a young specimen with the intention of buyinga bigger tank as it grows. However due to life’s unpredictable nature very few actually take this step, instead attempting to rehome the fish. Public aquaria are already inundated with far too many ‘cast offs’ from the hobby, and are unlikely to take a big fish off your hands. Very few fellow hobbyists will have the facilities to do so, either. It’s sad to think how many hundreds of these are doomed to a drastically reduced existence by the aquatic trade. Please don’t buy one unless you have the resources requires to house it for life already in place. It’s easily confused with the closely related and very similar-looking P. tigrinum. 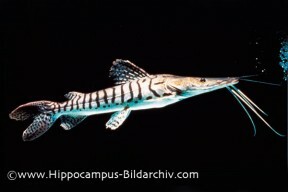 Indeed both are usually sold with the same common name of “tiger shovelnose”. In general, P. fasciatum exhibits a more irregular overall pattern compared to the uniformly striped P. tigrinum. This is not always a reliable means of distinguishing the two though, as they can vary considerably in appearance. For example over a dozen colour forms of P. fasciatumhave been identified, depending on locality. Unfortunately hybrids produced by crossing this species with other big Pimelodids such as the red-tailed catfish Phractocephalus hemioliopterus have been finding their way onto the market in recent years. These were initially bred for eating in Far Eastern countries but sadly have proved quite popular with some hobbyists. 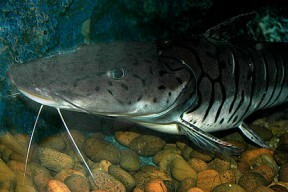 It’s a popular food fish in South America as well. Good write up, truly an amazing species to own – if you have a swimming pool to house it in.